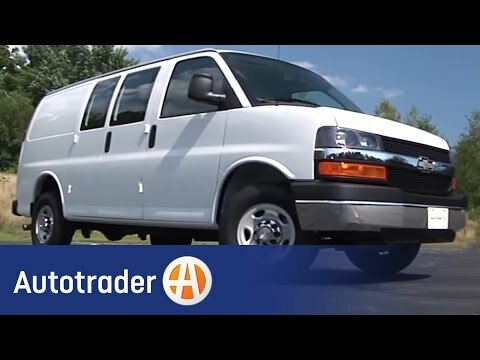 If you have a business and need a substantial amount of room for tools or storage, the 2009 Chevrolet Express Van is hard to top. A choice of four powerful V8 engines, varied towing capabilities and optional all-wheel drive makes the Express Van perfect for business and family use. Love my 15 passenger van! I love this 15 passenger van. We've had 3 'big vans' as our family calls them. Our Chevy is my favorite. I like how it has latch system for car seats and lots of lap and shoulder belts in the back for kids. One of my personal favorite traits is the split seat in the back. Passenger vans often don't have much cargo room so we typically leave the back seat out. Well, this van is split so we only leave half the seat out which gives us more seating while allowing room for groceries. I also really love the slider door. Much more convenient than the two 'barn' doors. All in all I'd recommend this van to anyone! We love it for our big family! It has issues which could not be diagnosed when it would not start. Although one repair place replaced the battery, it did not solve the problem. This went one for about five months, the last four months, no problem. Van is perfect for when buying large items especially when in antique business. It has crank windows and manual locks which I do not mind because that is less that can fail. Comfort is fair but being a full size van, it is more roomy when traveling. It is very good for transporting goods and passengers. We use this vehicle while traveling and it holds everything including a bed area for our two dogs. It is also great when purchasing large item and transporting them. I do not like that it does not have power windows or power door looks. No complaints except these vehicles are hard to replace with newer models. MAIN MOBILITY IS RECALLING 185 MODEL YEAR 2005 THROUGH 2009 CHEVROLET EXPRESS AND GMC SAVANA VANS MANUFACTURED BETWEEN APRIL 1, 2005 AND JUNE 25, 2009, EQUIPPED WITH RICON PLATFORM STYLE WHEELCHAIR LIFTS. THESE VEHICLES FAIL TO COMPLY WITH THE REQUIREMENTS OF FEDERAL MOTOR VEHICLE SAFETY STANDARD NO. 403, "PLATFORM LIFT INSTALLATIONS IN MOTOR VEHICLES." THE ANTI-STOW INTERLOCK MAY NOT DETECT THE PRESENCE OF A WHEELCHAIR OR MOBILITY AID USER. THE PRESSURE SENSING SWITCH THAT DETECTS THE PRESENCE OF WEIGHT ON THE PLATFORM WAS NOT ADJUSTED TO THE NECESSARY SENSITIVITY LEVEL. THE LIFT COULD STOW EVEN THOUGH SOMEONE OR SOMETHING IS STILL ON THE LIFT. MAIN MOBILITY IS WORKING WITH RICON TO CORRECT THE WHEELCHAIR LIFTS FREE OF CHARGE (PLEASE SEE 07E097). OWNERS MAY CONTACT RICON AT 1-818-267-3000 OR MAIN MOBILITY AT 1-716-759-6811. MAIN MOBILITY IS RECALLING CERTAIN MODEL YEAR 2008 AND 2009 CONVERSION VANS BUILT ON CHEVROLET EXPRESS AND GMC SAVANA CHASSIS FROM OCTOBER 2007 THROUGH MAY 2010 AND FITTED WITH CERTAIN RICON S SERIES AND K SERIES L-MODEL WHEELCHAIR LIFTS. DUE TO A PROBLEM IN THE SOFTWARE THAT CONTROLS THE LIFT'S "UP" FUNCTION, SHOULD THE "UP" BUTTON BE RELEASED BEFORE THE FLOOR LEVEL LIMIT SWITCH IS ACTIVATED, THE LIFT MAY CONTINUE ITS UPWARD TRAVEL AND MAY OVERRUN THE FLOOR LEVEL CUT OFF POINT. MAIN MOBILITY WILL NOTIFY OWNERS AND THE REPAIRS WILL BE PERFORMED BY AUTHORIZED RICON DEALERS FREE OF CHARGE. A SOFTWARE SOLUTION FOR THIS SAFETY DEFECT IS UNDER INVESTIGATION. UNTIL THE SOFTWARE SOLUTION IS AVAILABLE, RICON WILL PROVIDE OWNERS WITH A BULLETIN OUTLINING PROPER WHEELCHAIR LIFT OPERATION AND WILL SHIP OWNERS A DVD-BASED TRAINING AID TO PROMOTE PROPER LIFT OPERATION AT NO COST. THE SAFETY RECALL IS EXPECTED TO BEGIN DURING MAY 2010. OWNERS MAY CONTACT RICON AT 1-818-267-3000 OR MAIN MOBILITY AT 1-716-759-6811. GENERAL MOTORS IS RECALLING CERTAIN MODEL YEAR 2009-2010 CHEVROLET EXPRESS AND GMC SAVANA VEHICLES FOR FAILING TO COMPLY WITH FEDERAL MOTOR VEHICLE SAFETY STANDARD NO. 103, "WINDSHIELD WIPING AND WASHING SYSTEMS." THESE VEHICLES WERE BUILT WITH HEATING, VENTILATION, AND AIR CONDITIONING (HVAC) CONTROL KNOBS THAT MAY FRACTURE AND SPIN ON THE CONTROL SHAFT. THE DRIVER MAY NO LONGER BE ABLE TO CONTROL THE HEATING, COOLING, AND VENTILATION FOR THE VEHICLE. DEALERS WILL REPLACE ALL HVAC CONTROL KNOBS FREE OF CHARGE. THE SAFETY RECALL IS EXPECTED TO BEGIN ON OR BEFORE MARCH 11, 2010. OWNER MAY CONTACT CHEVROLET AT 1-800-630-2438 AND GMC AT 1-866-996-9463 OR AT THE OWNER CENTER AT WWW.GMOWNERCENTER.COM. GM will notify owners. The manufacturer has not yet provided a remedy plan or notification schedule. Chevrolet owners may call 1-800-630-2438. GMC owners may call 1-866-996-9463. GM's number for this recall is 14082.